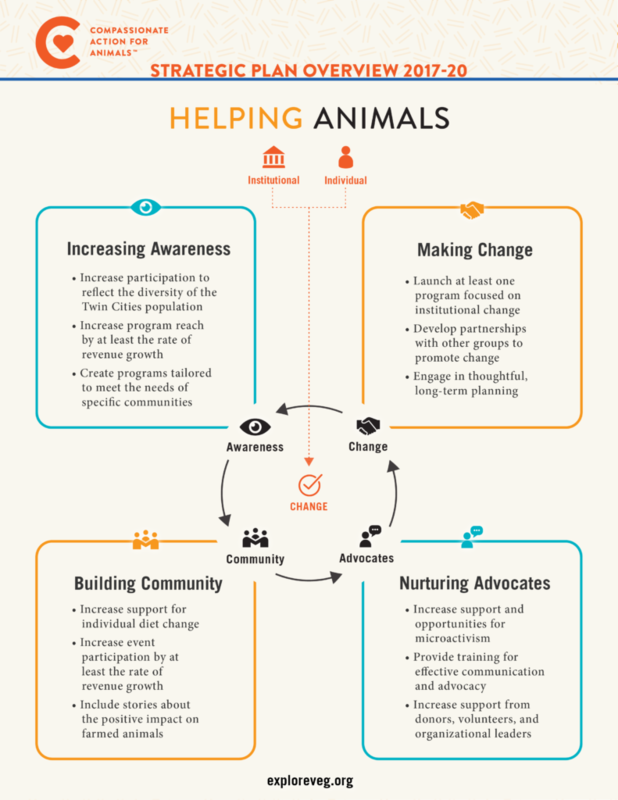 Compassionate Action for Animals’ 2017-2020 Strategic Plan was developed with an online survey sent to key stakeholders, two town hall meetings open to the community members, and a strategic planning meeting attended by staff, core volunteers, and board members. With the current strategic plan, we answer the question of how we can currently achieve our mission to encourage people to embrace their empathy and move toward a plant-based diet. The new strategic plan maintains the focus on farmed animals and upholds CAA’s core values. It also emphasizes a welcoming approach, which is recognized as most effective at creating change and models the empathy we want to promote. To implement the plan, all of CAA’s recurring programs are reviewed and modified accordingly. Specific action plans and evaluation methods are identified for each goal, and new programs are considered. CAA staff and board members have established a multi-year diversity and inclusion plans for programming and communications. They are also implementing expansion of the Bridges of Respect humane education program, making improvements to email communications, increasing student leadership, and developing a series of skill-building workshops for animal advocates. If you believe in our mission and our strategic plan, we encourage you to get involved. Sign up to give steady support through a recurring donation and sign up for one of our upcoming volunteer opportunities. We thank you for all the ways that you speak up for animals!